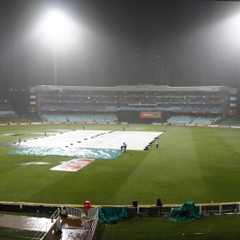 Cape Town - The Dolphins and the Knights along with the big fan turnout were left frustrated by the rain as their RAM SLAM T20 Challenge encounter was washed out at Kingsmead in Durban on Friday. After heavy rain during the week, the forecast had been clear for matchday, which began with clear skies on the east coast, but ended with more wet weather and a share of the spoils for the two sides. The covers were only brought on 40 minutes before the start, but from then onwards, were brought on and off several times leaving umpires Johan Cloete and Lubabalo Gcuma with little choice but to call off the game around 20:30. It was a disappointing end for the close to 6 000 fans who turned up for the first home match of the season for the Durban-based franchise. The Dolphins are again in action again on Sunday when they travel to the Highveld Lions (14:30). While the Knights only play again next Friday, when they come up against the Warriors.